Pumpkin spice muffins are full of fall flavor that melts in your mouth. They're the perfect fall treat for breakfast or dessert. Preheat oven to 350 degrees. Grease mini muffin tin. Combine flour, baking powder, baking soda, salt, cinnamon, ginger and nutmeg. Add eggs, pumpkin puree, sugars, and oil. Mix until just combined. Bake 10 minutes. Remove from oven and allow to cool 3 minutes. 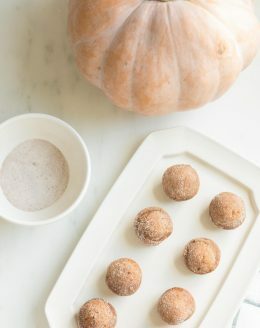 Combine sugar and spices in a bowl suitable for dipping. Dip muffins in butter, followed by sugar and spice mixture. While best served warm, this Pumpkin Muffin Recipe can be made in advance. Just store in an airtight container, up to 3 days at room temperature or frozen up to 3 months. Warm them at 350 degrees in the oven or in the microwave, then dip in butter and sugar and spice mixture just before serving.